The TK-803R offers full control and ability to switch between up to 8 systems. With its rack mount design, the model is perfect for use in server rooms and enterprise environment. Without specialized software, you are limited to switching between the systems connected to 1-4 ports when using hotkeys. 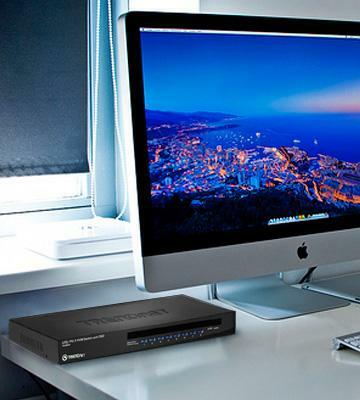 Owing to support of Windows OS series (up to Windows 7), Linux and Mac OS operating systems this multiport TRENDnet device is one of the best KVM switches on the market. 8LEDs available make the switch operation much easier in case of switching between many systems. 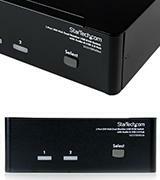 In addition to the standard VGA outs, this Startech switch provides a digital video signal out for each system connected via two DVI ports. The device offers additional USB ports, which you can use for connecting various peripherals. Connecting cables are not included, so you have to purchase them separately. Designed as an easy-to-use device, this KVM switch needs no drivers for its operation. 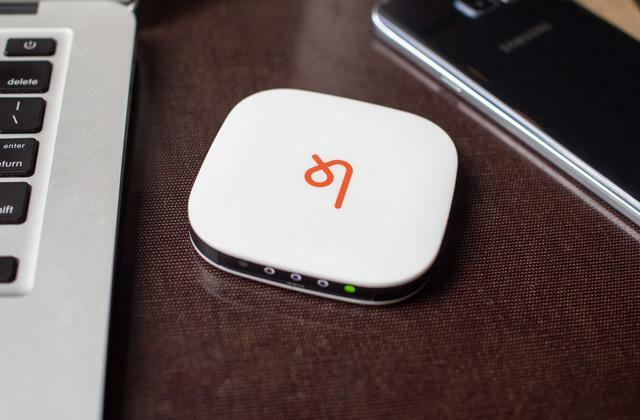 Even more flexibility of use is achieved owing to the OS-independent architecture of the switch. 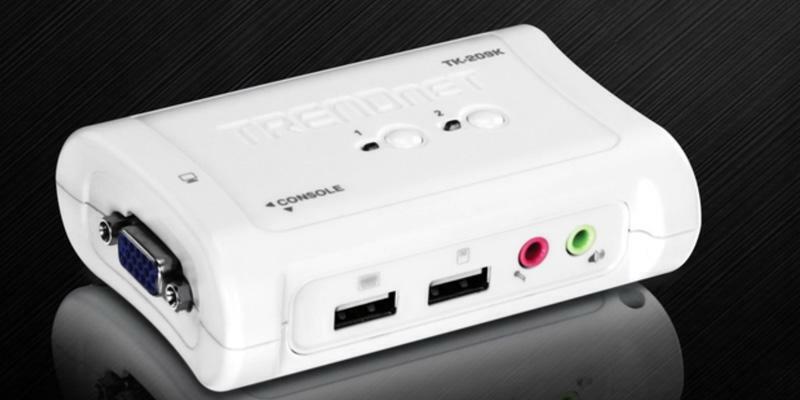 This TRENDnet model comes with 3.5mm audio in and out on the console side. 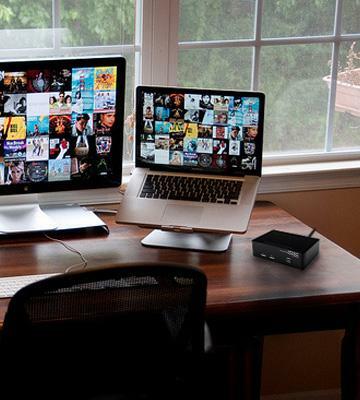 It can also pair with wireless keyboards and mice via the console USB ports. Redefining hotkeys is possible only for Windows-based PCs. With its compact design and no dedicated power supply required, this model makes a comprehensive switch solution. The hot-plug feature support greatly simplifies peripherals connection. Despite its compactness, the Iogear GCS24U supports a connection to up to four systems. 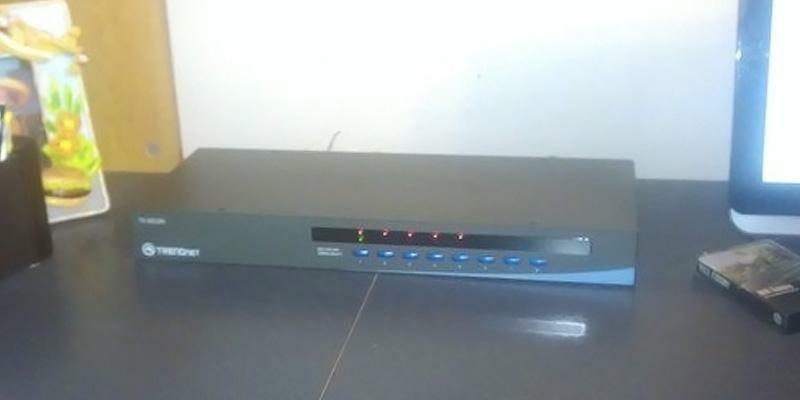 This KVM switch model comes with molded-in connection cables for your convenience. In case one of the connection cables fails, its replacement might be troublesome. You can use four pushbuttons on the top surface of the device to instantly switch to the desired system. The remote switching control included greatly facilitates using a configuration with more than two PCs/workstations connected. 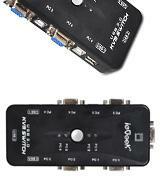 This switch box by ieGeek offers up to four KVM connections. With that, the bundled 5-feet connection cables are longer than those of most competitors. Does not support a hotkey switching feature. As many convenient digital switches, this model offers an additional USB port on the console side to connect various portable media and data input/output devices. This modern switch box has an envious support of operating systems, which includes even Novell Netware. For many users, it is very important that their KVM devices could manage a large number of connected computers or laptops. Controlling many targeted systems is what KVM switches are most often used for in industrial and commercial applications as you can hardly find a person who has more than two or three PCs or laptops at home. 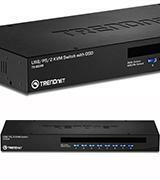 On the other hand, if you are looking for an optimal version of a KVM switch for a small server room, we suggest taking a look at the TRENDnet TK-803R model. As a rack mount type of switch, the TK-803R’s design makes it easy to place the device together with the rest of the equipment in the cabinet. With this switch, you can control up to 8 connected systems. For the convenience of switching between the computers, there are combinations of hotkeys available, thus you will not have to reach for the switch each time you choose another current system. However, the push button switching is also supported. The hot plugging feature and Plug&Play technology support definitely come in handy when working with several target workstations and pieces of equipment. The list of input USB devices supported includes Microsoft IntelliMouse, IntelliMouse Explorer as well as Logitech NetMouse and other optical mouse models. 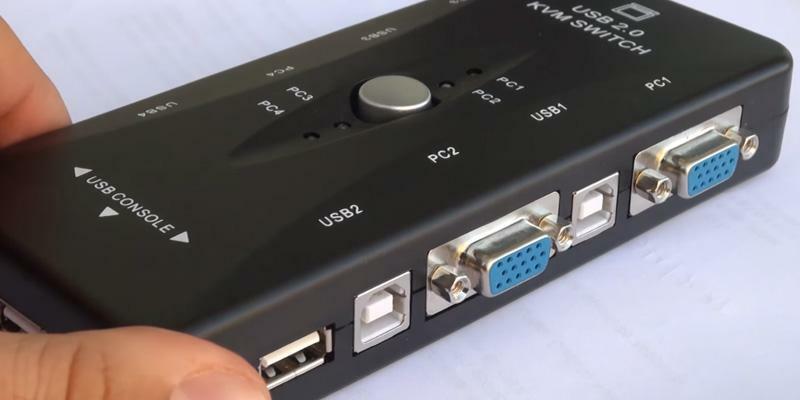 When outputting the video to console display connected via the VGA port this control and switching hardware provides the maximum video resolution of up to 2048 x 1536 pixels, which exceeds the Full HD resolution and has a 4:3 aspect ratio. Add the TRENDnet TK-803R’s compatibility with Windows, MacOS and Linux operating systems and you’ll have a concept of the functionality of this KVM device. 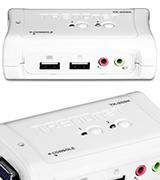 In addition to its multiport functionality, the TRENDnet TK-803R offers a great versatility of use. It is achieved not only by supporting the control of workstations and PCs running on Windows OS family (from Windows 98SE to Windows 7), Mac OS and Linux but also by offering the upgradeability of the KVM switch firmware via PC port. The switch manufacturer also took a good care of the convenience of the product use by fitting it with a LED display for an easy status monitoring as well as beeping sound indication of port switching (port enable/disable confirmation). Other features that make using the TK-803R easier are restoring the keyboard status when switching between controlled PCs and auto-scan for monitored PCs with the scan interval adjustable in the 10-99 seconds range, which greatly facilitates the work when you need to reboot target systems often. With the USB port onboard you are free to connect not only standard keyboards but also the ones with advanced features or specialized ones like gaming keyboards to the switch. Manufactured in a compact KVM design for a desktop use this model by StarTech is encased in a sturdy metal chassis, which makes it suitable for any environment. 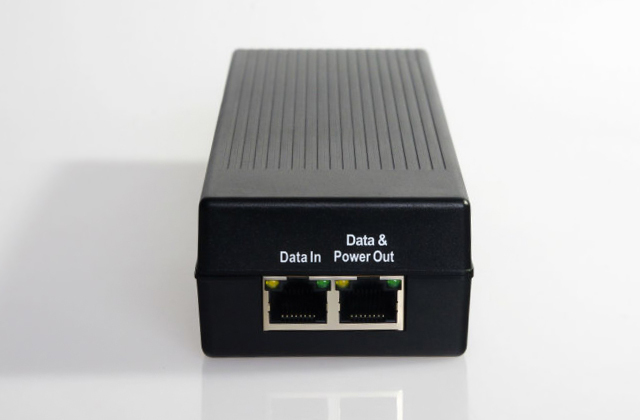 The SV231DDVDUA is a switch that comes with two ports for computers connecting. While this model allows you to control only two target systems it provides a comprehensive control and many multimedia features competitors don’t have. To begin with, this device is a dual monitor KVM Switch that enables switching between two systems, with that each can be equipped with both analog VGA and digital DVI display interfaces. With this StarTech model, you can control two dual-display systems as it supports a dual display configuration on the host side for you to select between your DVI-D and VGA displays with up to 1920 x 1200 pixels maximum resolution. 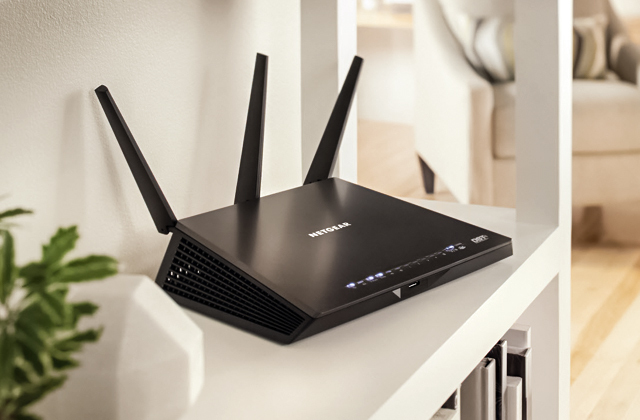 On top of the advanced video connectivity, the SV231DDVDUA offers extended audio features: for each system you hook up you are provided with audio in (mic in) and line/headphones audio out. This design enables a full interaction with connected PCs or notebooks via the multimedia channels and widens the range of the switch application scenarios. 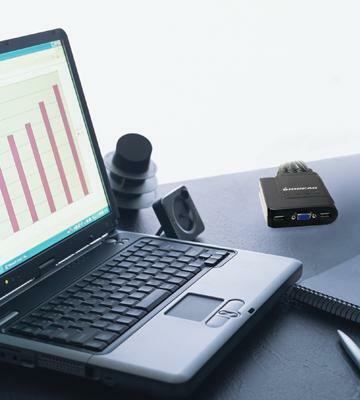 As for USB devices connectivity, this StarTech switch delivers a great versatility featuring an integrated two-port USB hub that conveniently allows connected USB 2.0 peripheral hardware to be shared between connected PCs, laptops or workstations. If needed, you can connect up to four input devices on the console side with two mice and two keyboards to share between the connected computers. 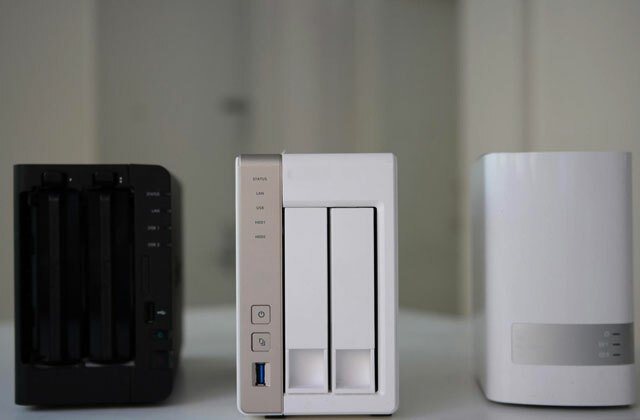 On the other hand, the hub feature eliminates the necessity of purchasing duplicate peripherals and allows you to cut down maintenance expenses. The availability of many physical connections on the SV231DDVDUA is complemented with its high versatility in terms of the target systems software environment, as the switch is completely OS-independent and does not need any drivers for the operation. This approach opens the possibility of switching between two PCs running on different operating systems seamlessly. Also, you will have no worries about adjusting the resolution on the displays connected, as the switch supports the DDC2B emulation and EDID pass-through features enabling the display adapter to detect and auto-configure the display resolution to match its visual capabilities. Owing to the USB hub of this switch model you can increase the storage space of the targeted systems on the go using USB flash drives. TRENDnet designed a very compact solution for controlling two PCs or workstations with one set of keyboard, monitor, and mouse. This model has a plastic rounded-edges case with all the connection ports arranged along its perimeter. On the left side, the front face accommodates two USB ports for connecting a console keyboard and a mouse and 3.5 mm audio in and out to the right. On the left face, there are two audio ports, one for each system. 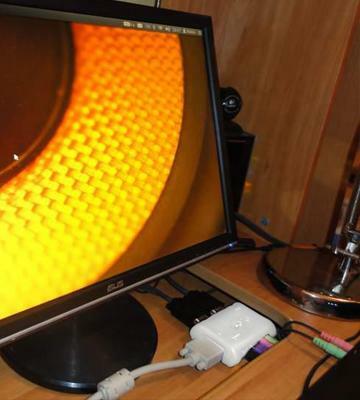 Owing to such ports configuration you can control one PC while listening to the audio played back on the other connected system. 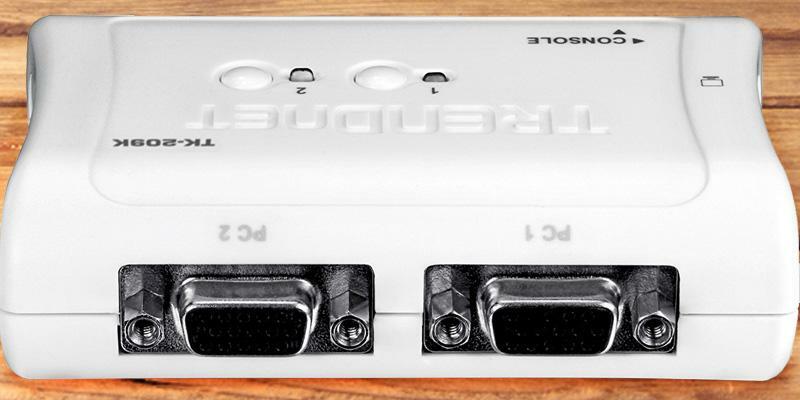 Finally, on the rear face, this TRENDnet KVM switch has two VGA ports for plugging in the cables connecting the device to target systems. 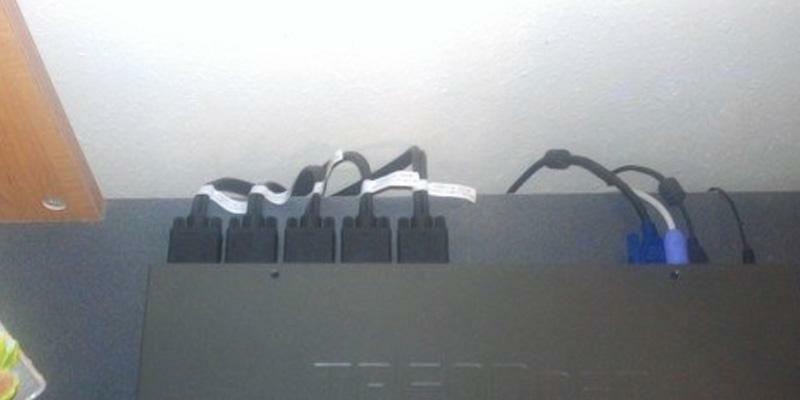 With that, the two connection cables that come in the model package split into VGA and USB connectors each on the connected PC side. 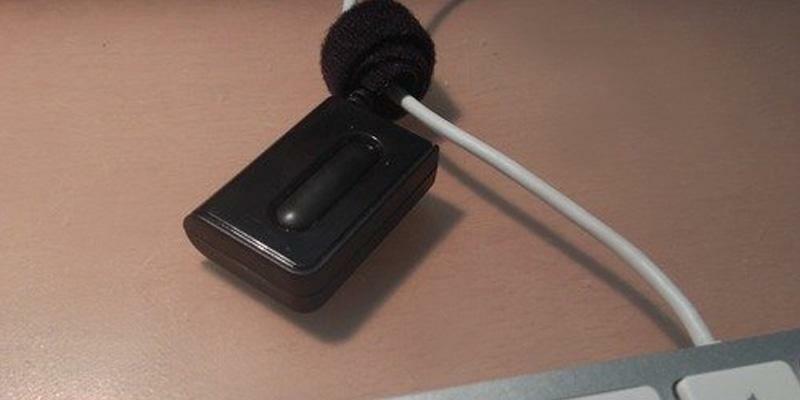 Using the available USB ports you can connect various optical mice, Microsoft Intellimouse, Logitech Net Mouse, and many similar pointing devices to the switch to control the target systems. With this TRENDnet device, you can get the full use of advanced control features of such peripherals, which are aimed primarily at using under Windows, as the digital switch is designed to control the PCs and workstations based on Windows OS (from MS Windows 98 to XP and 2003 Server), as well as Linux-powered systems. The VGA ports of the switch support the video out to the connected monitors at up to 2048 x 1536 pixels resolution. 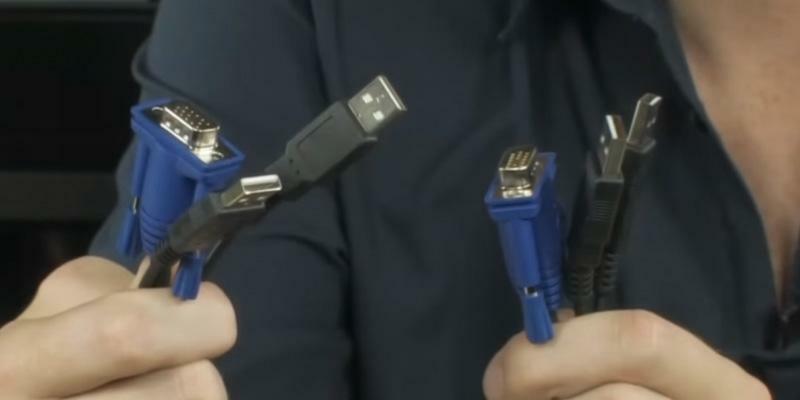 It is important to note that the bundled KVM cables also provide power to the switch (from the USB ports of the systems connected) so it dispenses with a power adapter, unlike many competing solutions. In addition to the flexible power supply configuration, this switch also supports a hot-plug feature. It allows you to add PCs or remove the connected PCs when you need it without powering down the KVM Switch or the other PC connected. This convenience feature partially compensates for a comparatively small number of connections to targeted systems supported. As for the switching method, this model supports the switching by user definable hot-keys (for Windows systems only), by push button or using the Windows-based client software. The switch supports an auto-scan and has a LED display for an easy monitoring of the controlled systems status. Eventually, with the set of features, this model has it is a no-brainer for home or small office use. 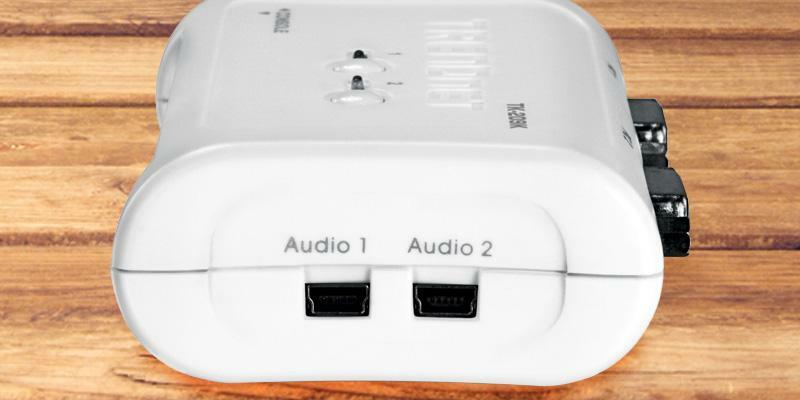 Using two USB Mini B ports on the switch together with two bundled USB Mini B to 3.5 mm jack cords you can share your computer speakers or headset between the connected PCs. Thus, you can route an audio output signal from a 3.5 mm port of one system to the analog input of the other one with these additional audio ports. With all its compactness and small weight, the GCS24U model is quite feature-packed. This KVM switch by Iogear is made as an out-of-box solution with molded-in control cables and a 6-feet remote control cable. Designed for controlling up to four PCs or workstations with a single set containing one USB keyboard, one USB mouse and a VGA display this switch offers a molded-in bundle of two USB and one VGA connector for each of the four connected systems. Thus, you will have all the needed cables at hand and already plugged on the switch side when using the device, which will save you effort and time. To switch between the systems you can use the four buttons on the device front panel or the remote button switch, which you can conveniently put on your table so you won’t have to reach for the device itself. On the console side, the switch makes use of the DDC2B version of the Display Data Channel Standard to read the extended display identification data of the display connected and to automatically adjust the resolution to be in line with the monitor capabilities. The maximum console display resolution supported by the GCS24U is a decent 2048 x 1536 pixels, which allows you to use high-resolution QXGA displays with this switching device. The GCS24U does not require a dedicated power adapter as it draws power from USB ports of the connected machines. Another benefit of this 4-port USB switch by Iogear is its plug-and-play architecture enabling you to hot-swap the peripherals and targeted systems. At that, you get a full support for Mac keyboards and mice with programmable buttons as peripheral control devices. Like many modern switches, the GCS24U supports a variety of operating systems, including the series of popular Windows, Linux, Mac OS and more specialized SunOS by Solaris. This model supports Windows 2000 or higher, Mac OS 9.0 or higher, Sun Solaris 9 or higher operating systems on the connected PCs and requires no driver installation for the basic operation. However, for working with workstations and PCs that run on Unix and other Unix-based operating systems, for example, Linux, you may need to install some drivers and additional support software for the switch to operate. The GCS24U 4-port switch also performs a function of a cost-effective solution, which increases the use security by allowing you to switch between Internet-connected PCs and Intranet-connected PCs. 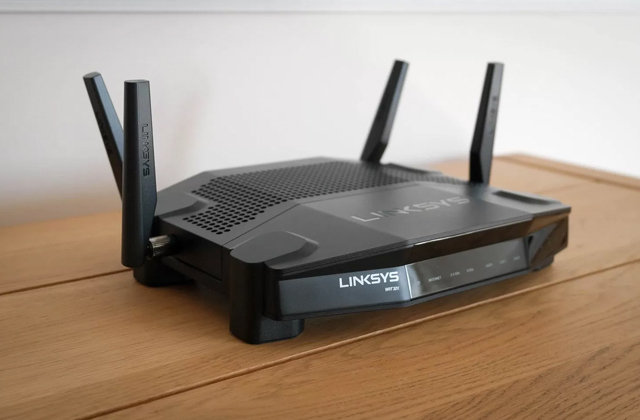 This scheme enables an isolated system operation and addresses possible issues caused by attacks and infection of the system you control from the Internet. 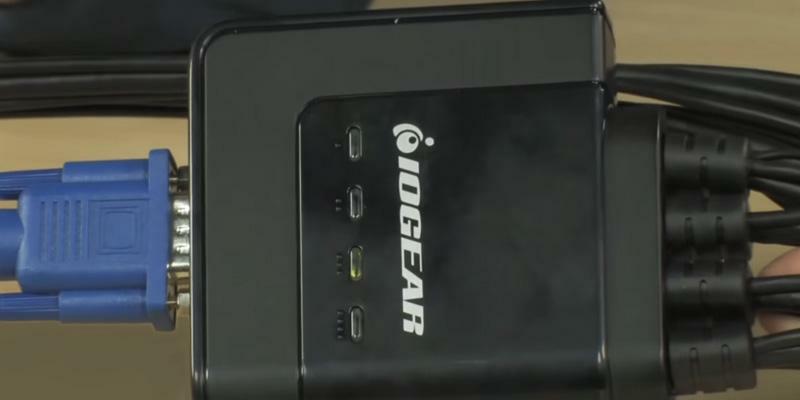 Despite the availability of only two USB ports on the host side of this IOGEAR model, you can connect more USB-devices to it if you use a USB Hub. This multi-port ieGeek switch makes it possible to control up to four PCs from a set of one USB keyboard and mouse connected! The ieGeek KVM switch is a great and simple-to-use solution for controlling workstations, test benches, desktop PCs or other connected systems when switching between multiple systems is needed. 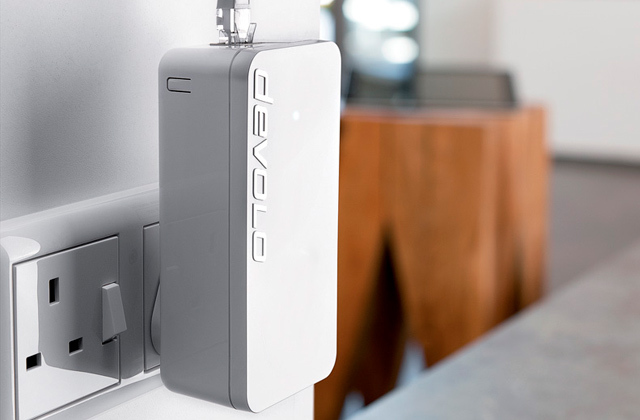 With its Plug and Plug architecture, the device offers great flexibility as for using the three USB ports on the host side for connecting various peripherals and disconnecting them on the fly when you need to replace them with other USB-enabled devices. The manufacturer has got you covered in case you need to use all the available system connections out of the box as the supply package of this switch includes four KVM cables. As the KVM connection cables supplied are 5-feet long you also get enough room when laying cables and managing the connections. 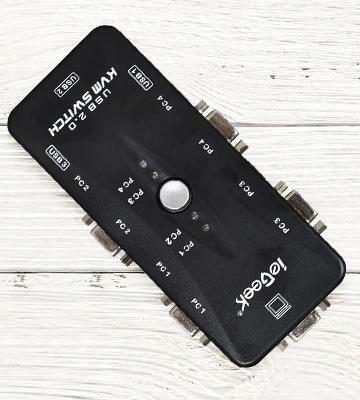 On the video side of things, this ieGeek provides the support for up to 1920 x 1440 pixels video resolution, therefore you can connect a widescreen LCD display with a VGA input to this keyboard-video-mouse switch device. 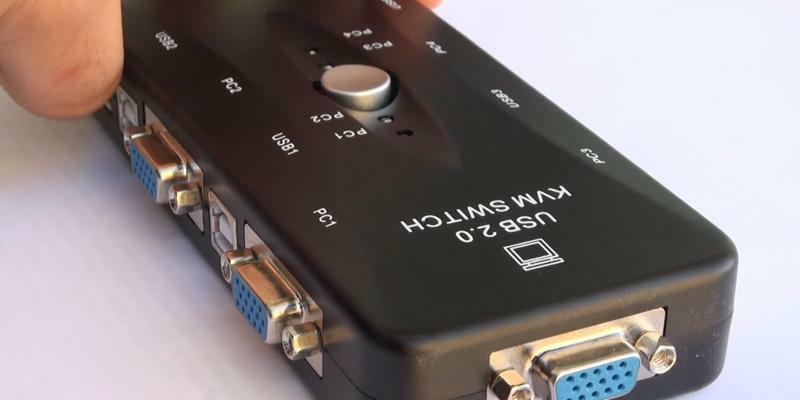 One little aspect that makes this multi-connection device a bit inconvenient is the absence of the remote switching feature, which is implemented in remote control KVM switches. Another downside is that switching between target systems on this model is performed by using a single push-button on the top. With that, you can switch to the system you want to work with at the moment only by pushing the button consecutively until you select the system needed, as no instant switching is provided. For the indication of the currently selected system, there are 4 LEDs on the switch case. While requiring no drivers installation or additional configuration for its operation, this switch box was designed compatible with target PCs and workstations that run on the line of Windows operating systems starting from Windows 98 to Windows 7 32bit edition. In addition to Windows PCs, the switch is also compatible with machines running Mac OS, Unix and Linux operating systems. An interesting feature implemented in this switch is the compatibility with Novell Netware-based systems, which are seen pretty seldom these days as this OS enjoyed too narrow a sphere of application in corporate and enterprise computing and networking, besides even this niche market, was dominated by more popular operating systems by other vendors. To use your computer mouse with comfort and avoid frustrating moments of failing to click icons and other UI elements due to a bad control of the mouse pointer we recommend choosing a good mouse pad. 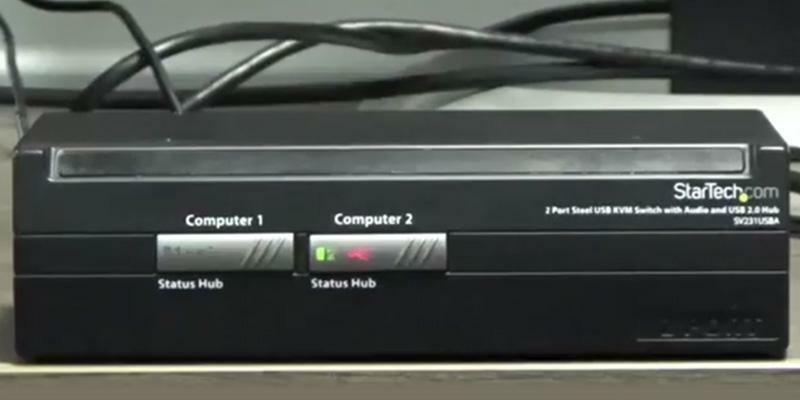 A KVM switch (KVM here is used as an abbreviation for "keyboard, video, and mouse") is a piece of equipment that allows its user to control multiple workstations, PCs or CPUs from one or several sets consisting of a mechanical keyboard, video monitor, and a computer mouse. 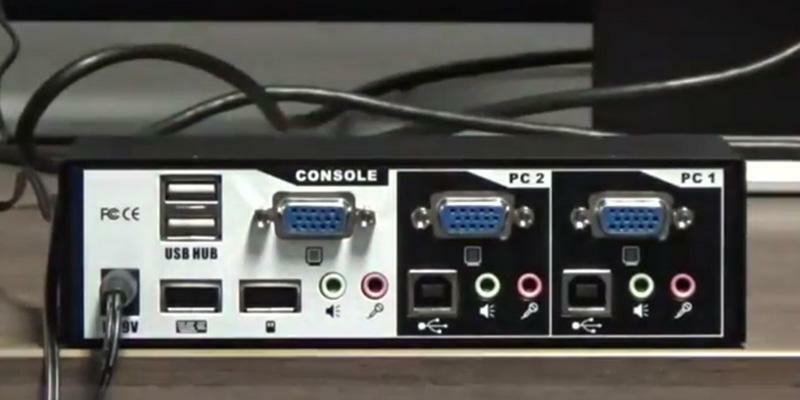 These sets are called consoles and such a connection scheme can be especially useful if there is not enough space to accommodate a large number of monitors and keyboards (for example, in a server room rack or on a small desktop). With that, some switch models allow for connecting keyboards (including mini and ergonomic keyboards) and mice not only via PS/2 ports but also via USB ports, which, if available, often can be used for connecting other peripheral USB devices (such as audio hardware and portable storage drives). In addition to the number of ports and consoles supported, switches also differ in the method of switching between currently controlled workstations and computers. Despite the fact that such hardware switches support the connection to multiple computers, in practice, you can control a smaller number of computers at any given time using the KVM switch. If you encounter the need for controlling several computers or workstations from one keyboard with an ability to quickly switch between them, a KVM-switch is definitely for you. 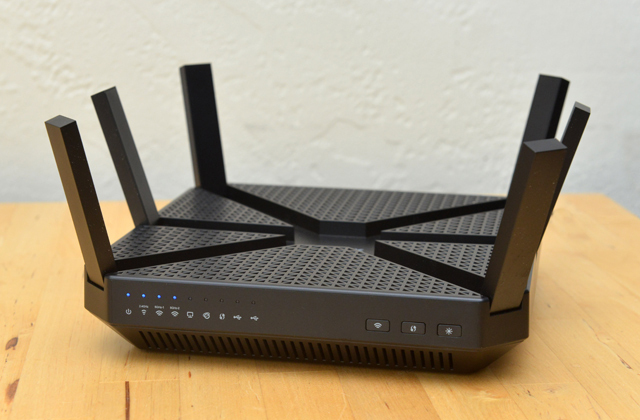 Before you start choosing one we recommend deciding on its installation type and the maximum number of computers connected each via a single port as well as ports for hooking up control hardware on the host side. Usually supporting from 2 to 32 computers connected simultaneously, switches are designed for a desktop installation (desktop type) and for installation in racks (rack mount type), which are a better fit for the use in server rooms. Some rack mount switches already come with a built-in keyboard for controlling and switching between the connected systems, which can be complemented with external keyboards. 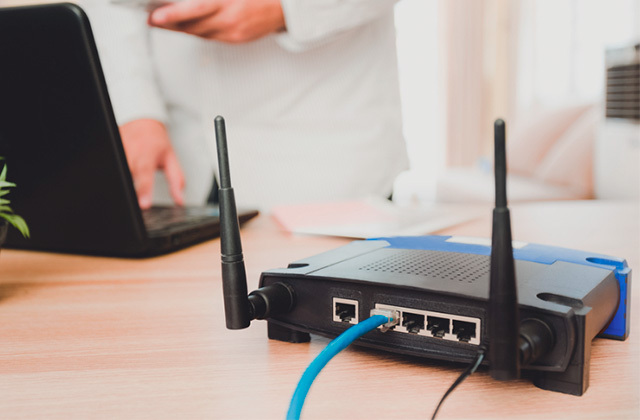 Therefore, when considering the switch model you need, make sure it has a sufficient amount of ports for connecting all workstations or laptops you plan to control. Another important KVM switch parameter to take into account is the number and type of ports for connecting devices on the host side. 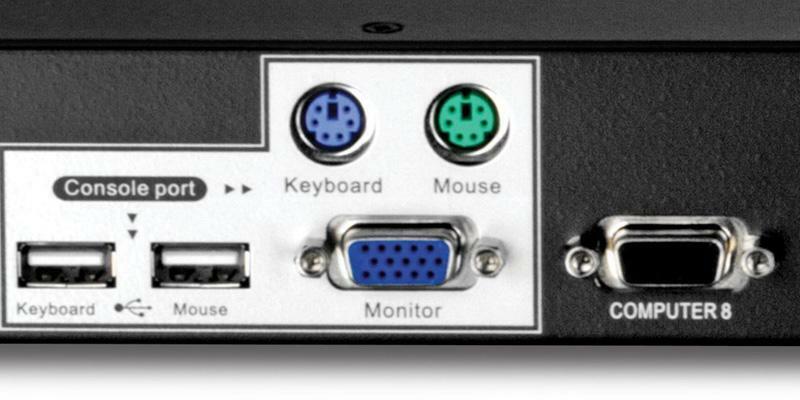 With either PS/2 or USB ports for connecting keyboards and mice used for controlling the systems connected, the basic set of ports for control hardware on switches includes at least one display port so that you could keep an eye on your manual input results and the situation on the workstation or PC you switched to. In practice, the USB equipped switches have an advantage over those with PS/2 ports owing to the USB versatility and support for not only HID (human interface device) but portable storage and other devices as well as keyboards and mice with additional functionality. The same applies for monitor ports: older models of switching equipment are fitted with analog VGA ports compatible with old CRT or flat panel monitors while the newer and professional-oriented models offer digital DVI, HDMI and even DisplayPort connections compatible with modern high-resolution displays. Obviously, the more input ports your switch has the wider your control possibilities are. 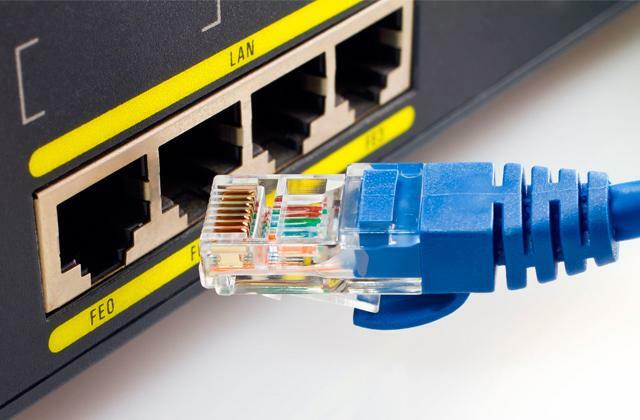 Though the type and numbers of input and output connections are crucial for a switch the method of controlling and switching between the workstations and PCs also plays an important role. The switching methods used in different models are based on different types of core technologies implemented for the switch to handle USB I/O devices (touchscreen displays, keyboards, mice, etc.). A switch model functionality depends directly on the switching method used. In general, there are USB Hub Based KVMs (connected/shared USB devices go through the full USB enumeration/initiation upon each switching to another target system), Emulated USB KVMs (have dedicated USB console ports assigned to provide a generic emulation of special sets of USB keyboard/mouse switching control info for each connected system), Semi-DDM USB KVMs (dedicated USB console ports can work with all USB-HIDs, but can’t maintain the presence of the connected devices to all of the targeted systems at once), and DDM USB KVMs (same as semi-DDM ones but maintain special functions and parameters of the connected devices to each targeted system). The video bandwidth supported by the switch directly influence the resolution and refresh rate for the video signal output to a connected monitor this model supports, which concerns mostly models with analog video out. As typical consumer-grade KVM switching devices provide the bandwidth of up to 200 MHz, they support high-definition (720p and higher) resolutions with the 60 Hz refresh rate. Q: What do KVM switches actually connect? A: In general, these devices are used for controlling several (usually up to eight) PCs, laptops or workstations connected to them via special ports from a single set of input and peripheral devices connected to the dedicated console ports on switches. In most cases, this set includes a keyboard and a mouse as primary input devices. However, users are allowed to connect other pointing devices (trackballs, joysticks, gamepads, touch pads, etc.) 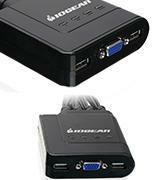 with USB interface to a switch if there are USB ports available. A monitor is connected to the console side for the user to see what is going on the system currently selected. In other words, KVM switches do not connect target systems with each other they rather connect a set of input devices to each target system on the user choice. Q: Is it possible to exchange data with the systems connected to the switch other than via KVM cables? A: Yes, there are several options for that. Some switches, for example, carry dedicated audio ports on the console side, which you can use to route an analog output from one of the connected systems to your headphones, audio receiver or active speakers or connect a microphone to the system. 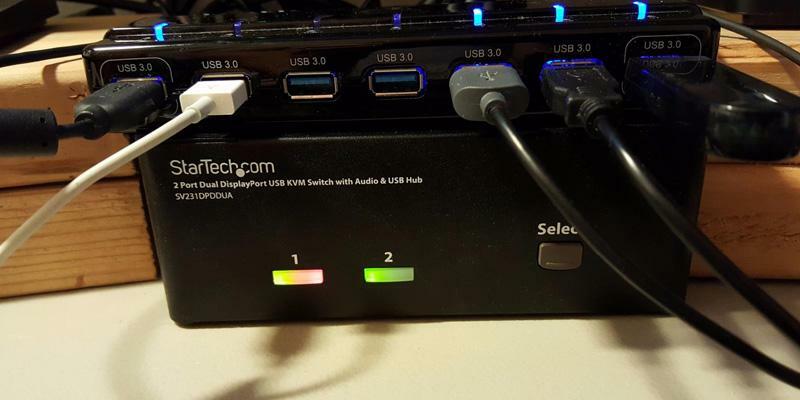 Another option is to use USB hubs on the switch to connect the hardware plugged into USB ports on the console side to target systems via their USB ports. 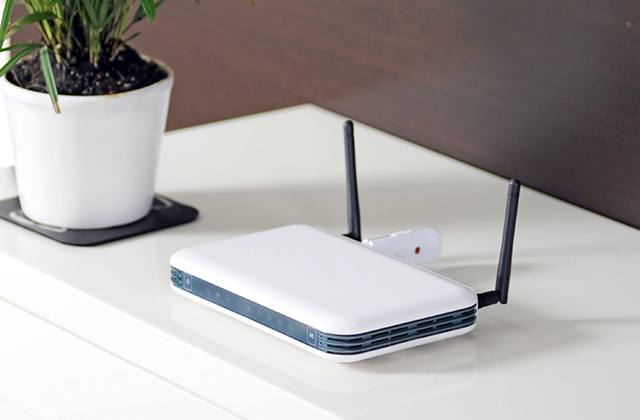 Thus, you can pair various portable media or printing/scanning devices with the systems connected using the switch. In this case, you may need drivers installed. Q: What are the benefits of controlling several systems from one switch? A: In addition to eliminating the need to reconnect your keyboard and mouse every time you need to switch to another system, you can monitor the processes occurring and applications running on any of the systems connected using a single display. You can hot-plug peripherals and portable media and connect them to target systems of your choice with a possibility of quickly plug and unplug them owing to having the connections at hand. Q: Is using KVM switches for controlling several systems secure? A: Yes, such switches allow controlling multiple PCs or workstations running them completely separate from each other. Owing to the design of KVM switches, there is no data connection between them via switches as you have only a keyboard, mouse and display connected to each system at a time. Therefore, there is no exposure of data on one system to data on the others. 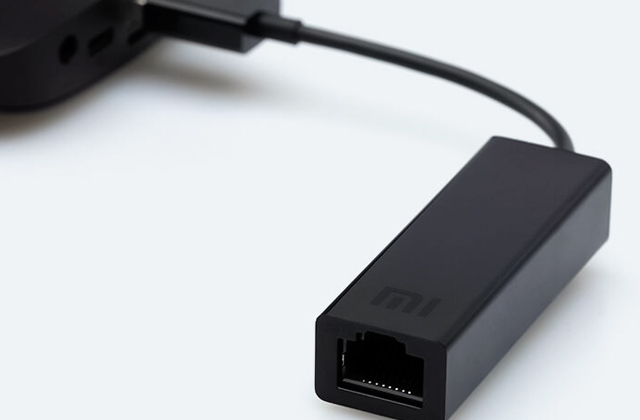 If needed, you can transfer data from one target system to another using portable media connected to USB ports on the switch so you will know what data is transferred and where to. 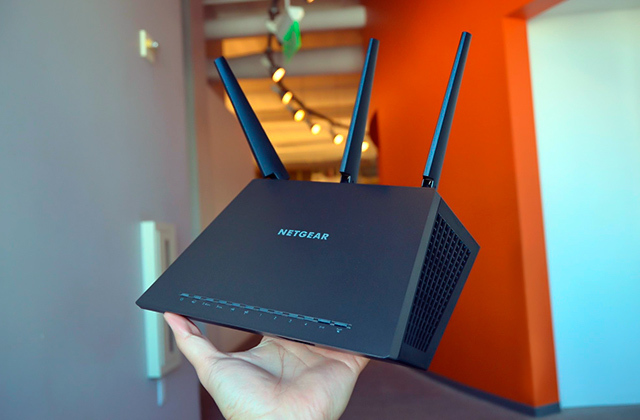 Moreover, you can switch between systems that have an Internet connection and those that don’t in order not to expose the data you currently work with on one PC or workstation to possible Internet attacks while having an Internet access on another PC to search for the info you need. Q: Do switches need a separate power supply for their operation? A: It is not always the case. Though some models use a dedicated power adapter to run many models draw power from USB ports on the connected systems eliminating the need for a power socket for their operation. 1. Guide to KVM Switches, L-com. 2. What is KVM, Aten. 3. KVM switch (keyboard, video, mouse switch), Wikipedia. July 30, 2016. 4. 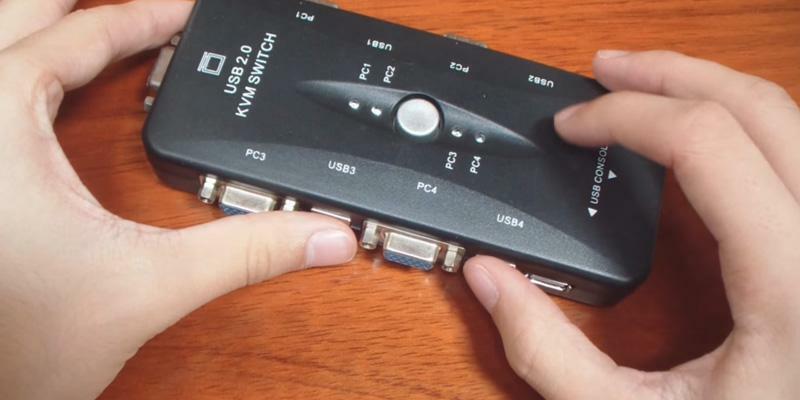 What is a KVM switch, and how can I tell if it will work in my setup? Startech.